There are many superb destinations that you can visit whch are within easy reach of Central London. Listed below are some popular sights – do feel free to ask about others. Chartwell The very personal home and garden of Sir Winston Churchill.Hampton Court Palace Henry VIII had several honeymoons here. 150 years later King William III and Queen Mary II commissioned Sir Christopher Wren to rebuild parts in Renaissance style. Impressive 16th C Tudor kitchens, splendid gardens and the world-famous hedge maze and Great Vine. Hever Castle An idyllic setting. Queen Anne Boleyn’s (King Henry VIII’s second wife) childhood home and later the home of William Astor. Leeds Castle A fairytale setting on a lake, associated with many Queens of England. Penshurst Place Birthplace of Philip Sydney, courtier to Q. Elizabeth I. Tudor country house, formal gardens and toy museum. Sissinghurst Perhaps the most famous garden in England created in the 1930s amongst the surviving parts of an Elizabethan mansion. Thames Valley Pretty villages (Cookham, Marlow) and locks on the river: Toad of Toad Hall country. Waddesdon Manor Baron de Rothschild’s fabulous Renaissance-style chateau and 18th C collections. West Wycombe Sir Francis Dash wood’s (founder of the Hellfire Club) theatrical Italianate home and rococo landscape garden. Windsor Castle 900 year old favourite official residence of Her Majesty the Queen. Visit the magnificent State Apartments and St. Georges Chapel. There are many combinations of visits possible on day trips. Click on one of the links below for suggestions or see prices page for popular combinations. Please contact Marksman Tours to discuss other options. Bath An elegant Georgian city with its 2000 year old Roman Spa baths and temple complex, Costume Museum, Jane Austen connections and great shopping. Combine with Stonehenge or Salisbury. Brighton A seaside resort with the exotic oriental Royal Pavilion built for King George IV. Browse in The Lanes for antiques or enjoy one of the tea shops. Also see nearby Arundel Castle dating from the 11th C now with wonderful works of art and home of the Duke of Norfolk. Cambridge and Ely or Suffolk Villages Sit under Sir Isaac Newton’s apple tree, admire Henry VIII’s King’s College Chapel, go punting on the river Cam. Combine with Ely’s magnificent medieval cathedral or visit Oliver Cromwell’s house. Explore local antique shops in the villages, meander through the countryside, sample an English afternoon tea or a drink in a quaint country pub. Canterbury England became Christian in Kent in 597AD. Stroll through the medieval city streets and see the magnificent Cathedral, the world-renowned Pilgrimage centre of the Middle Ages where Thomas a Becket was murdered in 1170. See a 7th C Saxon church. Combine this with a visit to Leeds Castle, Sissinghurst, Chartwell or Dover. Cotswolds Explore charming villages such as Bourton-on-the-Water, Broadway, Stow-on-the-Wold, the Slaughters and Chipping Campden with their honey-stone walls and thatched roof cottages, rolling hills, Roman villas and stately homes. Visit famous gardens open to the public, such as Hidcote and Sezincote, good restaurants and charming country pubs. Dover Castle The keys to the Kingdom. With its 2000 year old Roman lighthouse, Henry VIII’s keep and the secret WWII wartime tunnels, this is a great day out. Combine with other sites in Kent. 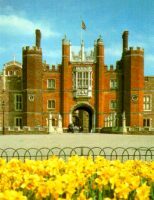 Hampton Court Palace Famous home of King Henry VIII and his wives. Easily combined with other destinations to make a memorable full day tour. Kent Gardens, homes, castles, pretty villages, rolling hills and country churches. 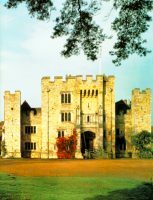 Sites include Hever & Leeds Castles, Chartwell, Penshurst Place. Capture the essence of a typical English gardens by visiting, for example, Great Dixter or Sissinghurst. See Rudyard Kipling’s home, Bateman’s in the Sussex Weald. Mooch around the antique shops or enjoy a typical afternoon tea! Oxford, Blenheim Palace and Woodstock Oxford is the oldest university in the UK. Visit its colleges and university buildings, see where Harry Potter was filmed and the inspiration for Alice in Wonderland. Visit the Churchill family home, Blenheim, see Churchill’s grave, take tea in the charming village of Woodstock or rent a punt in Oxford and glide along the river. Portsmouth and Portchester Castle This Historic Dockyard is home to two flagships: Nelson’s HMS Victory and King Henry VIII’s Mary Rose which sank nearby in 1545. Visit the D-Day museum home of the Overlord Tapestry and Portchester Castle with its well-preserved Roman and medieval defences. Rochester and Chatham Rochester, with its many Charles Dickens associations, also has a fabulous 11th C castle, a medieval cathedral and a beautiful high street. Experience the historic Royal Naval dockyard at Chatham. Salisbury Home of a graceful 13th C cathedral with the tallest spire in Britain. The Magna Carta is on view in the magnificently carved Chapter House. Combine with Stonehenge and Wilton House, still the ancestral home of the Earl of Pembroke with glorious 17th C State Apartments and a stunning picture collection, including the Van Dyck series painted for these rooms. Stratford-on-Avon Shakespeare’s town: visit his birthplace, Ann Hathaway’s cottage, the church where he was christened, see the theatres and the lovely half-timbered houses of the town, relax on the river banks and feed the swans. See some of the surrounding villages in the Cotswolds that he visited. Warwick Castle An impressive stronghold with the oldest parts dating back to the 900s. See the Earl of Warwick, the “Kingmaker” readying himself for battle during the Wars of the Roses, creep into the dungeon, walk on the walls and in the gardens, see “a Royal Weekend Party” in the Private Apartments attended by Queen Victoria’s son, grandson and Winston Churchill. Combines well with a trip through beautiful Cotswold villages. Winchester was Alfred the Great’s capital of England and the cathedral founded there in 1079 is where Jane Austen is buried. Combines naturally with a visit to Salisbury. Windsor Castle In addition to the castle, explore the town and Eton with its famous College. England first became Christian in Kent in 597AD and Canterbury became the centre of this new religion. A visit based in Canterbury is a perfect place to experience the flowering of Christianity in England. A relaxing day in the country, in Kent, Sussex or The Cotswolds. Visit delightful villages, stop to browse the antique shops, gaze at flowers, enjoy the beautiful rolling hills and countryside, pop into an old village church and have a delightful English traditional afternoon tea. North West in the Cotswolds: Snowshill Manor; Batsford Park, especially the arboretum and bamboo garden and Hidcote Manor, designed by the American Major Johnston, in the English Cottage gardens style. West of London: Cliveden, former home of the Astors, set on cliffs 200ft above the Thames; Dorney Court and Hampton Court Palace, with several different garden areas, including the recently restored parterre, laid out as the 17th C original, formal and water gardens, delightful spring garden and maze. South East in Kent, Surrey and Sussex: Bateman’s, home of Rudyard Kipling; Wisley (Royal Horticultural Society); Petworth, magnificent late 17th C house in a beautiful deer park, landscaped by “Capability Brown”, as painted by Turner; Leonardslee, for its collection of unusual trees, rhododendrons and azaleas; Scotney Castle Garden, romantic garden surrounding the moated ruins of a 14th C castle; Claremont, the earliest surviving English landscape garden; Sissinghurst Castle Garden, perhaps the most famous garden in England; Sheffield Park, 18th C with a series of lakes linked by cascades, and Wakehurst Place, magnificently laid out in a naturally dramatic setting. South: Broadlands, home of the Mountbattens, landscaped setting by the river Test and Mottisfont Abbey, famous for its rose gardens. Your trip can include Chartwell, home of Winston Churchill; Penshurst Place, birthplace of Philip Sydney, courtier to Q. Elizabeth I; Petworth; West Wycombe Park; Osterley Park; Marble Hill House; Syon House; Chawton, Jane Austen’s home or Wilton House, architect Erno Goldfinger’s home. From 3500 BC to 50BC, from stone circles to Iron Age hill forts, an unforgettable look at ancient England. Windsor Castle, home of the Queen; Hampton Court Palace, both Tudor and “Wrenaissance”, lived in by The Royal Family until the 19th Century; Leeds Castle, a fairy-tale castle on a lake built over 1000 years ago; Hever and Bodiam (built 1385 and practically unchanged since). Stately Homes such as Blenheim Palace, (Duke of Marlborough); Waddesdon Manor (Baron de Rothschild) and Knole (Tudor mansion, Sackville-West family). Extended tours give you the opportunity to travel in a relaxed and unhurried way. Spend much less time sitting in the car on London based day trips and more time relaxing and enjoying the sights. Extended tours can start and finish anywhere in the country. A professional guide will accompany and guide you around places of interest so you get maximum benefit and pleasure from your visits. If required, your guide can assist with itinerary planning, and organise the day to day arrangements, whilst you relax and enjoy the tour. This could include visits to the cities of Oxford, Bath and Gloucester (both Roman towns, and locations of Harry Potter filming), Salisbury and Winchester, some castles/homes such as Blenheim, Sudeley, Berkeley, some garden visits, the ancient standing stones of Stonehenge and Avebury, and of course drives through the beautiful and varied English countryside with lovely pub lunches, picnics or afternoon teas.Stay in any type of accommodations from a simple B & B to a hotel or a Manor House or luxurious Country House Hotel. Have a day away in the beautifully preserved medieval town of Bruges. Known as the Venice of the North both due to its canal system and because it used to be a very rich European city, you can take a boat trip, meander the delightful cobbled streets, visit many churches and museums. Eating is the Belgian national pastime and Bruges is not short of wonderful eating places and cosy cafes! Stop at the port of Ostend on the return leg for wonderful fresh fish. (I speak fluent Dutch/Flemish) Drive down through Kent and Sussex to the Channel Tunnel. After a 35 minute journey under the English Channel, we arrive in France, then Bruges is about 75 minutes drive away. If you have a long layover at Heathrow or Gatwick, or you need to transfer from one airport to the other, and have some available time (and energy!) for sightseeing or wish to relax in the English countryside, perhaps visiting a garden, I’ll tailor-make a timed itinerary for you and get you back to the airport on time for your connecting flight.For Heathrow: Hampton Court Palace, Thames-side villages, Windsor Castle, Gardens or London, perhaps shopping too, or London AND country if enough time.For Gatwick: Brighton, Arundel Castle, Petworth House, Chartwell, Hever Castle, Wakehurst Place Garden, Gardens or London, perhaps shopping too, or London AND country if enough time.